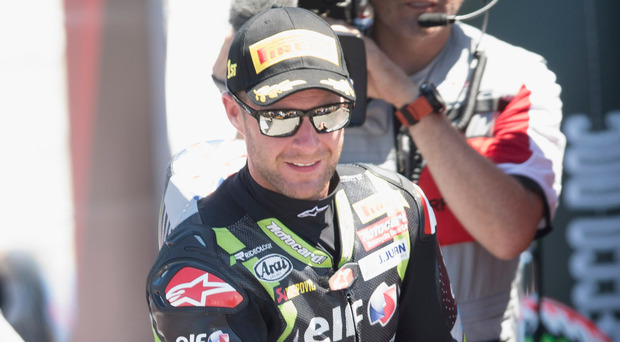 Jonathan Rea's chances of adding to his record-breaking season were scuppered by a 'Desert Storm' that hit the Losail Circuit in Qatar on Saturday. Torrential rain and high winds took its toll on paddock facilities and although the track partially dried out to allow the Supersport race to take place resulting in a 'rookie' world championship for German rider Sandro Cortese after his only rival Frenchman Jacques Cluzel crashed twice in the closing stages. A statement followed from the Race Director saying: "Due to the increasing standing water, as well as considering the difference between power and tyres of WSBK and World SSP bikes, this led us to decide racing would not be safe in these conditions." Unfortunately, this resulted in the final race of the 2018 season being cancelled with Jonathan ending the season with 545 points and 17 victories with Chas Davies in the runner-up position, a massive 189 points behind the dominant Templepatrick rider. The record breaking four-time world champion said after the cancellation. "It was a difficult situation today," said Rea. "From one side it is frustrating not to be able to finish the season when you are geared up to race, however on the flip side conditions were really difficult, especially at Turn 15, where the water was not draining at all and every time they tried to clean the track water was coming up from the gravel bed. "I feel sorry for the fans that turned out to see us race, but safety is paramount. "We can look back at our season and be really proud of our efforts. Roll on 2019." On 2019 Rea commented: "We will now have a family holiday before the winter testing programme starts. "You know the racing this ear was about two seconds faster than last year despite the dumbing down of the rules. Progression never stops, so for next season with new bikes, upgraded bikes and new riders it will be a new challenge. Our aim is to keep winning and I'm already excited." The cancellation also denied Eugene Laverty the opportunity to end his association with Milwaukee Aprilia with a good result following his fourth-place finish in Friday's opening race, won by Rea. The Toomebridge rider said: "Fair to say the right call was made given the conditions. "It's not the way anyone wanted to finish the season. "I was gutted to lose a podium position after a great last lap with Alex Lowes in Friday's opening race and was looking forward to Saturday's final race of the season, but it wasn't to be. At this stage I only hope I can remain part of the show next year." During the Foyle Club two-day Beach Race meeting on the East Strand, Portrush Glenn McCormick scored nine wins from nine starts in the Solo Expert class, Neil Campbell and passenger Craig Parmenter won seven of the eight sidecar races with Emma Moulds and Niki Adair scoring the other victory while the nine Quad races saw 3 wins for Dean Dillon, 3 wins for Richard Toye , two for Sean Goss and 1 win for Kyle Murphy after some spectacular racing. Meanwhile, Spaniard Maverick Vinales claimed his first MotoGP win of the season in the Australian round at Phillip Island. The 23-year-old, who was second in qualifying, crossed the line more than 1.5 seconds ahead of Andrea Iannone, with Andrea Dovizioso third. Champion Marc Marquez began on pole but was forced to retire after a high-speed collision with Johann Zarco on lap six. Meanwhile, Briton Cal Crutchlow has had surgery after breaking his ankle in Friday's practice. Crutchlow will be replaced by test rider Stefan Bradl at next weekend's Malaysian Grand Prix but remarkably targeted a return in the final race of the season in Valencia on 18 November. LCR Honda's Oscar Haro said: "He wants to be in Valencia. He's thinking of riding there. You know how these guys are, especially Cal, he's a pitbull and he's keen to get back because he wants to defend the Independent riders title. It was a hard fall and it' a complicated operation."